When you cough a lot, it ends up working out the muscles around your rib cage and your diaphragm. Because of this, it is entirely possible to develop sore ribs from coughing. It is similar to how you feel sore after working out. When you use your muscles over and over again in a workout, they naturally feel sore. This same process is the reason why your ribs feel sore after coughing. Each cough is basically working out the muscles in and around your ribs. You are straining to breath and cough, and your muscles are just trying to catch up. If you have a severe cough, it may even hurt to breathe deeply or sneeze. You may develop sore ribs, but your ribs are not actually sore. It is only the muscles around the ribs that actually feel sore. Can You Get Sore Ribs From Coughing? The short answer to this is absolutely. While your rib pain can be due to something else, it could certainly be caused by the intensity of your cough. Your ribs have a muscle between each individual rib that are known as intercostal muscles. These muscles are used when you breathe or cough. They are basically used to expand the thoracic cavity so that air can flow into your lungs. The diaphragm pulls downward at the same time. This creates a negative air pressure like a vacuum that causes the air to flood into your lungs. When you exhale, the intercostal muscles and diaphragm work to shrink the thoracic cavity so that the air is pushed outward. When you cough a lot, you are basically working out these muscles more than normal. Like any muscle, the diaphragm and intercostal muscles can become sore and tired. Your rib soreness may just be due to your cough. What Are Other Reasons Why Coughing May Give You Sore Ribs? While you may just have sore ribs from coughing, there are other conditions that can cause the soreness as well. As always, it is important to go to your doctor for a diagnosis to make sure that your symptoms are not a sign of a more serious ailment. There are many different lung diseases that can cause soreness around your ribs. 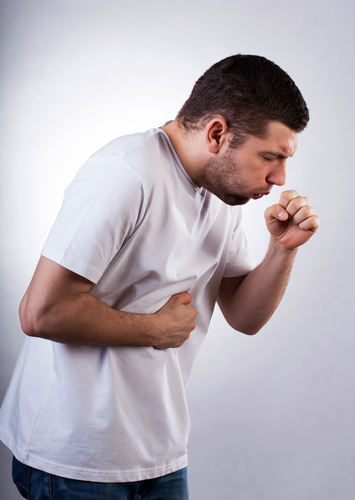 Pleurisy is one of the more common causes. The pleura are the membranes around the lungs. When they become inflamed, fluid builds up between them. This can cause you to experience pain whenever your chest has to expand and contract for inhaling and exhaling. Costochondritis is a medical term that refers to when the cartilage between the ribs becomes inflamed. When you have this problem, you may feel extra pain where the ribs connect to the sternum at the front of the chest. When you sneeze or cough violently, it can cause even more pain and sensitivity. You may also experience pain during breathing as the intercostal muscles become inflamed as well. Problems like osteoporosis can cause the ribs to actually become sore instead of just the muscles becoming sore. Osteoporosis can cause the bone density to drop, so your bones become weaker. A small injury can end up cracking the ribs, which makes coughing extremely painful. This condition is particularly common as you get older. You should go to the doctor immediately if you have pain that increases instead of decreases over time. IF you are suddenly out of breath, go to the doctor. Any pre-existing condition like rheumatoid arthritis, osteoporosis or osteoarthritis is a sign you should go to the doctor because you may have a cracked rib. You should go to the doctor if you have persistent pain for three to four days that does not improve with rest. In addition, anyone who has an infection such as pleurisy should go to the doctor to get medication for treating their condition. If you think that you have strained or tired out your muscles from coughing, there are some at-home remedies that you can use. To start with, try taking a medication to treat your cough. If your cough can be alleviated, it will give your muscles time to recover. Cough drops, expectorants or cough suppressants may be able to help. Give yourself rest so that you can recover. Avoid lifting or carrying any heavy objects that could further strain your muscles. You can also apply a cold compress for 15 minutes at a time to help limit the inflammation, pain and swelling. This can be a simple ice pack that is placed on your chest for 15 minutes every two hours. You do not want to place the ice pack directly on the skin though because it could cause tissue damage. Instead, wrap it in a cloth before you apply it. There are certain things that can make the pain worse. Massages, heat, exercise and alcohol can all cause the pain to become worse. Until you feel better, do not use heating pads or take a hot bath. Alcohol can cause the injury to worsen and can also weaken your immune system as you try to heal. Obviously, you should also avoid any exercise while you are trying to heal. After three days of rest and care, you can apply a gentle heat to the affected muscles to reduce the pain. You can also start moving the area a little at a time as you start to heal.